Just the other day a mystery device believed to be the Lumia 530 passed through the FCC and now we might be getting our first real look at it. Two photographs, allegedly of the Lumia 530, have been shared by Weibo user iokeyboy and spotted by WMPoweruser. 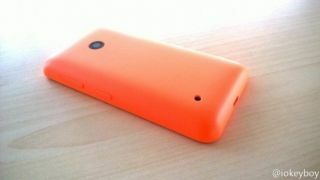 We can see both the front and back of the device and it looks fairly convincing, albeit a lot like any other Lumia. However going by the photos it has on-screen buttons, rather than the hardware ones found on the Lumia 520 and Lumia 525, but like those phones there's no camera flash. There's not a whole lot else that can be gathered from the images, but it's rumoured that the phone will have a 4.3-inch display, a Snapdragon 200 processor and 512MB of RAM, so it's set its sights squarely on the bottom of the market. While according to the FCC listing it should come in at 62.3 x 119.7mm and include a microSD card slot and a removable battery.